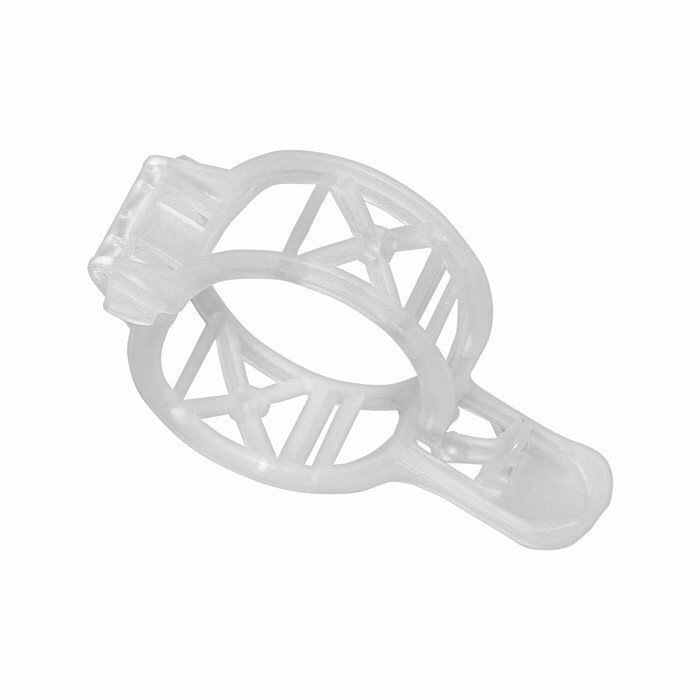 We provide a unique pack 50 TomatoClips® with a diameter of 22mm. 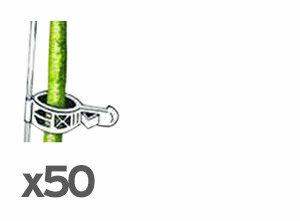 By extending more string, you will be able to easily stake a dozen plants with 50 clips. It is your call, depending on the type of tomato, the topography of your garden, terrace or vegetable garden, and of your sense of practicality, to decide how you use them. set up a tight cable above your tomato plants. 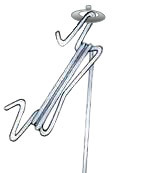 fit hooks or pitons above your tomato plants. 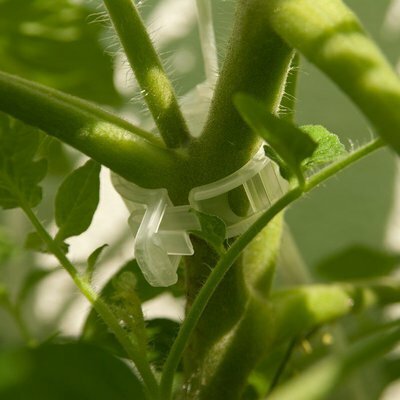 TomatoClip is designed to be able to single-handedly hook the clip on the stem of the tomato plant whilst setting its height on the string by stretching the string with the other hand. 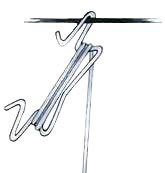 The hinge of the clip is equipped with clamps that clasp the string and block the clip at the desired height when it is closed shut. And vice-versa, to modify the height of the clip, all you need to do is open it (only one hand is necessary), place it at the desired height, then close it again. the opening/closing system can be handled with one finger, whilst holding the TomatoClip®. You can then guide the tomato plant along the string, adding several clips under the main ramifications: by pulling them up a little, the plant will be relieved of its own weight and will develop more fruit. The main problem with tomatoes is that the weight of the fruit requires the installation and maintenance of efficient stake systems as the plants rapidly grows. Otherwise the plant will spend an important amount of its energy staying upright instead of producing nice and juicy garden tomatoes. time consuming: considering that tomato plants grow rapidly, it is necessary to regularly attend to the position of stakes and ties, which takes a lot of time and eventually turns your plants into a true mishmash, rapidly inextricable. expensive: the numerous hazelnut tree or bamboo stakes required for the correct staking of the plants and the ties end up being quite expensive, especially if they are bought in small quantities. new set up from one year to the next: each year, in order to remove dead plants and prepare the soil for the next season, it is often necessary to take down the whole staking system... only to start again the following spring! TomatoClip® is a French patented system originally designed for greenhouse vegetable crops. 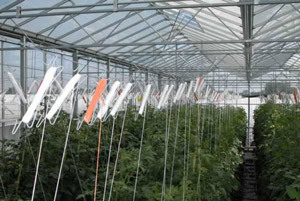 It gives greenhouse producers flexibility for staking tomatoes, and significantly increases production. We are happy to offer this ingenious system, usually combined with hydroponic soilless culture techniques and intensive use of fertilisers, and wish you good crops of healthy tomatoes, organic, bathing in sunlight and devoid of chemical products in your garden, on your balcony or in your vegetable garden. We thank the Agro Systèmes company, inventor of the TomatoClip® for supporting us with this initiative. water your tomato plants at the base, avoid spraying the foliage otherwise powdery mildew (very aggressive fungus capable of destroying your whole crop) may appear. nettle manure is an excellent repellent that will protect your plants from aphids, mites and mildew, and it is also invigorating for plant growth. If you have nettles at hand, it is very easy to make. coffee grounds, put down in a thin layer at the base of the plants after gently scratching the soil, keeps snails away and prevents weeds from growing. remove the suckers (cut with your nails or with clippers): the secondary buds that develop between a fruit-baring ramification and the main stem) either turn into sterile branches or branches that bear additional fruit that unnecessarily consume the energy of the plant or reduce the size of tomatoes on the main branches. ease of use - designed to maximize the yield of greenhouse tomato growing, each detail of the TomatoClip has been thought out for saving time, reliability and efficiency. 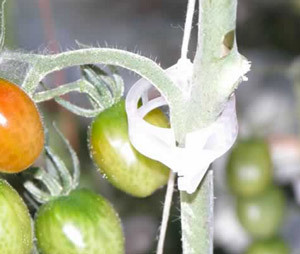 tested efficiency - used by the main European and North African greenhouse producers for years, TomatoClip® is far from a gadget you'll regret to have bought. The yield of your crops will speak for itself. excellent value for money - TomatoClip® is a staking system that is as practical as it is good value.